Indian police arrested hundreds of revellers after a frenzied night of festival fireworks turned city air toxic nationwide on Thursday despite a preemptive court ban on the smog-fuelling party. 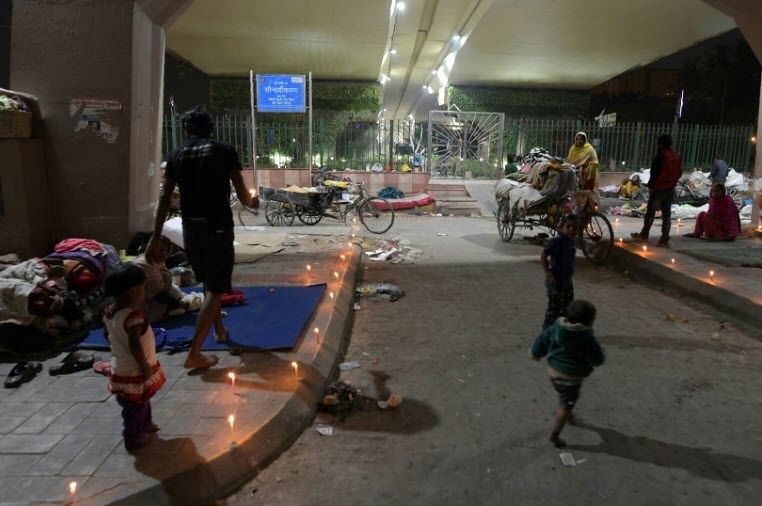 More than 300 people were arrested in Delhi, the world’s most polluted major city, where the Supreme Court had restricted public fireworks to two hours in the evening and insisted on use of cleaner “green” firecrackers to mark the Hindu festival of Diwali. But the choking capital’s 20 million residents largely ignored the court’s ruling and staged a free-for-all night of colourful, deafening pyrotechnics that left the megacity’s air more than five times over safe limits. Major Delhi monuments including India Gate and the Red Fort were shrouded in a noxious grey haze on Thursday. Commuters donned masks as visibility on major roads was reduced to barely 50 metres (yards). Ambient air quality touched 595 on Thursday morning, according to the US embassy in Delhi which independently monitors pollution levels. Cities like London and Paris by comparison recorded 41 and 52. Any reading over 100 is considered hazardous and a danger even to healthy people. Many Hindu hardliners, who have been emboldened since Prime Minister Narendra Modi came to power in 2014, have criticised the Supreme Court over the ban, terming it an attack on their faith. Inhabitants of other cities such as Kolkata in the east and Mumbai in the south also flouted the restrictions, pushing up pollution levels. In Kolkata more than 200 people were arrested, police told AFP. “For a few moments of enjoyment people are willing to endanger the planet. It is insane,” Pranav Yadav, a 19-year-old student in Delhi wearing a pollution mask, told AFP. “I expected people to show some concern but at this rate it won’t be long till every child in Delhi has a respiratory disease,” he added. Last year the Supreme Court completely banned the sale and use of the smoke-spewing crackers in Delhi after an 2016 “airpocalypse” at Diwali saw pollution levels rocket off the scale. Last month Delhi’s air quality was oscillating between “poor” and “severe” levels but had seen some improvement this week after mild winds swept the region, clearing up the dirty air. The city’s air quality typically worsens in winter, due to pollution from the burning of rice stubble, diesel engines, coal-fired power plants and industrial emissions, all trapped by colder air. Levels of PM2.5 — fine particles linked to higher rates of chronic bronchitis, lung cancer and heart disease — have soared since last month when farmers in nearby states started to burn crop residue. Last month the World Health Organization said exposure to toxic air indoors and out kills some 600,000 children under the age of 15 each year worldwide.